Finnish sauna bathing has been used for the purposes of pleasure, wellness, and relaxation. It is a tradition embedded in the culture of Finland, and it is basically accessible to everyone.1, 2 Beyond its use for pleasure, emerging evidence suggests that sauna bathing might offer a multitude of health benefits. Accumulating evidence suggests that regular sauna bathing may alleviate and prevent the risk of both acute and chronic disease conditions. During the past decade, a considerable amount of research data from various countries on the potential health benefits of sauna bathing as well as the putative biological pathways underlying these effects have been reported. Given the mixed evidence from the literature, there is a need to aggregate data to enable appropriate interpretation. This review summarizes the available epidemiological, experimental, and interventional evidence linking sauna bathing, cardiovascular outcomes, and other health benefits; the postulated biological mechanisms underlying these associations; areas of outstanding uncertainty; and implications for clinical practice. Given that there are different forms of passive heat therapy (eg, repeated hot water immersion, infrared sauna, Waon therapy, and Turkish bath), this review focuses only on the evidence from the traditional Finnish saunas because they are the most widely studied to date. We searched observational (prospective cohort, nested case-control, or case-control, retrospective cohort) studies, randomized controlled trials (RCTs), and non-RCTs from MEDLINE and EMBASE from their inception until February 24, 2018, with particular emphasis on Finnish sauna baths. Search terms included sauna bath, Finnish, cardiovascular disease, coronary heart disease, sudden cardiac death, heart failure, hypertension, blood pressure, dementia, depression, pulmonary disease, mortality, lipids, natriuretic peptides, hormones, endothelial function, inflammation, oxidative stress, arterial stiffness, arterial compliance, and intima media thickness. Studies were limited to those conducted in adult humans and written in English. Evidence from a number of experimental and epidemiological studies implicates sauna bathing to have a positive effect on blood pressure (BP) modulation. However, it appears that most of these reports were conducted in patients with preexisting vascular disease and/or evaluated only the short-term effects of sauna exposure on BP.10, 11 Two recent experimental studies by Lee et al7 and Laukkanen et al12 in 100 men and women (56% men; age, 32-75 years) with at least 1 cardiovascular risk factor reported reductions in both systolic BP and diastolic BP after 30-minute sauna bathing sessions. In addition to reductions in BP, sauna bathing led to positive alterations in measures of arterial stiffness such as pulse wave velocity.12 The mean carotid-femoral pulse wave velocity was 9.8±2.4 m/s before sauna and decreased to 8.6±1.6 m/s immediately after sauna (P<.0001). The mean systolic BP decreased after sauna exposure from 137±16 to 130±14 mm Hg (P<.0001) and diastolic BP from 82±10 to 75±9 mm Hg (P<.0001). Systolic BP after 30-minute recovery remained lower than presauna levels. Gayda et al13 studied the effects of sauna alone as an intervention vs the combination of exercise and sauna on ambulatory BP monitoring and central hemodynamic variables in 16 patients with slightly elevated BP. There were 8 prehypertensive patients (systolic BP, 120-139 mm Hg) and 8 stage I hypertensive patients (systolic BP, 140-159 mm Hg).13 A single sauna session produced positive effects on systemic BP assessed using 24-hour BP recordings. On the basis of this relatively small sauna intervention study, Gayda et al13 proposed that both exercise and sauna were important nonpharmacological strategies to reduce systolic and mean BP in patients with untreated hypertension. There is limited evidence on the long-term effects of habitual sauna bathing on BP or the risk of hypertension, especially in general population settings. In the only long-term prospective cohort study by Zaccardi et al14 conducted to date in 1621 men (age, 42-60 years) recruited from the general population, it was found that white men who took frequent sauna baths (4-7 sessions/wk) had an approximately 47% reduced risk of developing hypertension when followed for 24.7 years. In this study, participants had resting BP ranging within normal limits and were not using antihypertensive medication at the baseline examination.14 These results were adjusted for established risk factors and several other potential confounders that could have influenced the risk of hypertension such as alcohol consumption, socioeconomic background, and cardiorespiratory fitness (CRF) level. Regular sauna bathing may be beneficial in the reduction in high systemic BP; however, to confirm whether there is a protective effect of long-term sauna bathing on the risk of hypertension will need robust evidence from a well-designed RCT. The Table summarizes relevant characteristics and results of key studies that have reported the associations of sauna bathing with vascular and nonvascular outcomes. aCHD = coronary heart disease; CVD = cardiovascular disease; SCD = sudden cardiac death. The protective effects of Finnish sauna may also reflect lifelong habits, which may be at least partly comparable with the health effects of long-term physical activity. Although several studies have suggested a beneficial effect of sauna bathing on indices of cardiovascular function,11, 13 to our knowledge, only 2 reports have investigated the effects of regular sauna bathing on the long-term risk of cardiovascular disease (CVD). Laukkanen et al6 in their prospective cohort study of 2315 Finnish men followed for 20.7 years showed that higher frequency and duration of sauna bathing were inversely and independently associated with risk of sudden cardiac death (SCD), fatal coronary heart disease and CVD, and all-cause mortality. In this study,6 the analyies took into account a comprehensive panel of confounders that could have influenced the risk of outcomes and these included age, body mass index (calculated as the weight in kilograms divided by the height in meters squared), systolic BP, serum low-density lipoprotein cholesterol level, smoking, alcohol consumption, previous myocardial infarction, type 2 diabetes mellitus, CRF level, resting heart rate, physical activity, and socioeconomic status. Contrary to limited evidence linking sauna baths to an increased risk of SCDs,3 this long-term study conducted in Finnish men reported an increase in sauna bathing habits (frequency and duration) to be associated with a reduced risk of SCD (Table and Figure 1). In another prospective cohort study in 1628 men and women followed for 15 years, Kunutsor et al15 found that having regular sauna baths (4-7 sessions/wk) compared with 1 sauna session/wk was associated with an approximately 62% reduced risk of incident stroke. The association was similar for stroke subtypes (ischemic and hemorrhagic stroke). There have been suggestions that a combination of regular physical activity and sauna baths may confer more protection on cardiovascular outcomes. In 2 recent studies in the general Finnish male population, the combined effect of high CRF level and frequent sauna baths was found to be associated with a substantially reduced risk of future cardiovascular deaths, SCD, and all-cause mortality outcomes in comparison to high CRF level or frequent sauna baths alone.5, 19 These recent findings have practical implications, which indicate that high CRF levels, which can usually be improved by regular physical activity, when combined with frequent sauna bathing sessions, can substantially reduce the risk of these adverse cardiovascular outcomes. Evidence from well-designed intervention studies are needed to confirm whether the associations between high CRF levels, sauna bathing, and CVD outcomes are causal. Cumulative Kaplan-Meier curves for sudden cardiac death (SCD) according to frequency and duration of sauna baths. A, Frequency of sauna bathing per week. B, Sauna duration per session. Reproduced from JAMA Intern Med,6 with permission. The etiology of neurocognitive disease is multifactorial, with impaired cardiovascular function, inflammation, and oxidative stress postulated as being major contributors in its pathogenesis in addition to high systemic BP with elevated levels of common cardiovascular risk factors.20, 21 Emerging recent evidence suggests that sauna exposure may have protective effects on neurocognitive disease. In a population-based prospective cohort study by Laukkanen et al16 conducted in 2315 apparently healthy Finnish men aged 42 to 60 years at baseline, men who had 4 to 7 sauna sessions/wk compared with those who had 1 sauna session/wk had a 66% and 65% reduced risk of dementia and Alzheimer disease, respectively. Whether sauna exposure exerts its neurocognitive protective effects via mediation in the pathways contributing to these diseases or it is just an enjoyable activity that prevents or delays the development of these memory diseases is not clearly understood. Sauna bathing has been linked to an improvement in pain and symptoms associated with musculoskeletal disorders such as osteoarthritis, rheumatoid arthritis, and fibromyalgia.25, 26 Having sauna baths also improves headache disorders. In an RCT by Kanji et al,27 37 people with chronic tension-type headache were randomized to regular sauna bathing or advice and education for a period of 8 weeks, and sauna therapy was found to substantially improve headache intensity. Although there is some evidence from a Japanese study that thermal therapy improved the symptoms of patients with mild depression,28 to our knowledge, no study has as yet reported the effects of Finnish sauna bathing on depression. However, we have recently shown that men who had 4 to 7 sauna sessions/wk had a 78% reduced risk of developing psychosis in the future as compared with men who had only 1 sauna session/wk (J.A. Laukkanen, PhD, unpublished data, February 7, 2018). Although there is no robust evidence to suggest that sauna bathing can be used to treat or prevent skin disease, a study has suggested that sauna bathing may be of benefit to patients with psoriasis, as it facilitates the removal of hyperkeratotic scales.29 Indeed, a previous study has suggested a protective effect of regular Finnish sauna on skin physiology, as evidenced by stability of the epidermal barrier function, increase in hydration of the stratum corneum, and faster recovery of both elevated water loss and skin pH.30 Having regular sauna baths has also been reported to be associated with better health-related quality of life. In a cross-sectional analysis of 524 octogenarians followed in a longitudinal cohort study by Strandberg et al,31 physical function, vitality, social functioning, and general health were reported to be considerably better in those who were sauna users than in nonusers. Traditionally, sauna baths have been used for the purposes of pleasure and relaxation, which evidently reduce the stresses of everyday life. In addition, several mechanistic pathways have been proposed to underlie the effects of sauna bathing on vascular and nonvascular disease conditions. Evidence suggests that the responses produced by an ordinary sauna bath correspond to those produced by moderate- or high-intensity physical activity such as walking.32 Pathways implicated in the effects of sauna bathing on vascular disease and mortality risk include reduction in systemic BP14; improvement in endothelial function33, 34, 35; reduction in oxidative stress36, 37 and inflammation38, 39; beneficial modulation of the autonomic nervous system11; positive alteration in levels of circulating vascular risk factors such as natriuretic peptides40 and lipids41, 42; hormonal changes; improved arterial stiffness, arterial compliance, and intima media thickness7, 36, 40, 43, 44; and improvement in the cardiorespiratory system45 as well as cardiovascular function3, 4, 46 (Figure 2). Indeed, these pathways are involved in the pathophysiology of chronic disease outcomes such as type 2 diabetes and CVD as well as mortality. Although evidence on some of these pathways have been based on studies of other passive heat therapies such as Waon therapy, infrared saunas, and hot water immersion, there is a biological plausibility that Finnish sauna baths may exhibit these similar effects. A typical hot and dry Finnish sauna increases body temperature, which causes more efficient skin blood flow, leading to increased cardiac output, whereas blood flow to internal organs decrease.3, 4 Increased sweating is accompanied by reduction in BP and a higher heart rate, while cardiac stroke volume is maintained.3, 32 Sauna bathing stimulates hormonal changes, which include increases in levels of plasma renin, cortisol, and growth hormone.47 There is stimulation of the sympathetic nervous system due to the high temperature, which increases the production of norepinephrine.48, 49 Increases in levels of norepinephrine induced by sauna exposure have been reported to be similar to those induced by maximal physical activity.50 Sauna therapy may also exert its effects via the changes in levels of blood-based cardiovascular biomarkers such as markers of glucose metabolism and insulin resistance, natriuretic peptides, and cardiac troponin T and inflammatory markers such as interleukins and C-reactive protein, although data on this topic are still limited and further studies are warranted to elucidate these potential mechanisms. We have recently shown that regular Finnish sauna baths are associated with a decrease in circulating levels of inflammatory markers such as high-sensitivity C-reactive protein, fibrinogen, and leukocytes at baseline and long-term follow-up.38, 39 Whether sauna bathing has any effects on circulating interleukins is currently unknown. 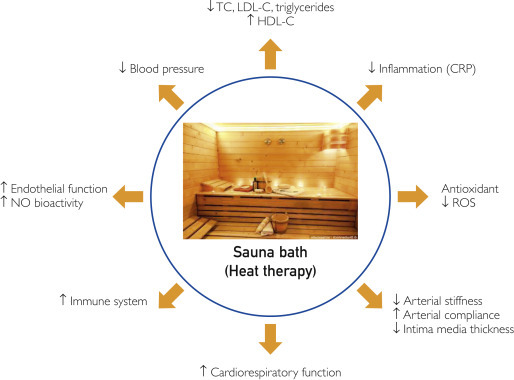 Finnish sauna baths have also been found to positively modulate circulating levels of lipids such as total cholesterol, low-density lipoprotein cholesterol, high-density lipoprotein cholesterol, and triglycerides.41, 42 There is also evidence that sauna exposure could boost the immune system,51 which may partly explain why sauna baths reduce susceptibility to common colds and prevent infections in healthy individuals.24 Furthermore, the effects of sauna bathing on vascular and nonvascular diseases may in part be mediated via reduced oxidative stress, as oxidative processes are known to be involved in the etiology of several disease conditions. However, evidence on the effect of Finnish sauna bathing on oxidative stress has been mostly conflicting. Although evidence has shown that a single sauna bath is able to reduce oxidative stress,36 another study reports that sauna exposure might increase oxidative stress.52 In addition to other potential pathways that might be involved, the effect of sauna on psychotic symptoms might be via an ability to promote mental health and well-being. The beneficial effect of sauna bathing on pulmonary conditions might be due to its direct effects on the airways and lung tissue, which include improvement in ventilation and lung function and reduction in pulmonary congestion.22 The pain-relieving pathways of sauna exposure in musculoskeletal conditions may be mediated via the sensory nerve endings in the skin.4 It has been reported that heat stress interspersed with intense cooling-off periods promotes the analgesic effects, as reflected by the increased circulating levels of β-endorphins.53 The feelings of relaxation and well-being associated with sauna sessions might be linked to the increased production of circulating levels of hormones such as endorphins.54 Given the established role of physical activity in protecting against vascular and nonvascular diseases as well as mortality and the emerging role of similar effects of sauna baths, the combination of both activities might have added health benefits. Indeed, we have recently shown that a combination of good fitness levels due to aerobic exercise and frequent sauna bathing confers more protection against the risk of cardiovascular and all-cause mortality events.5, 19 Further evidence is needed to find the mechanistic pathways linking sauna exposure and its effect on nonfatal and fatal or intermediate cardiovascular outcomes as well as other health conditions with subclinical outcomes such as arterial wall changes, especially in general populations. Sauna bathing is a pleasurable recreational activity and has a good safety profile, and most people in generally good health can tolerate a typical hot and dry Finnish sauna.3, 55 There is previous anecdotal evidence that people with cardiovascular conditions are discouraged from having sauna baths because the hot and humid environment imposes a burden on the cardiovascular system.4, 56 However, the overall findings from studies do suggest that sauna bathing is safe for patients with stable CVD, such as those who have recovered from myocardial infarction and patients with stable angina pectoris or compensated heart failure.3, 57 It has been reported that heat therapy in patients with heart failure is associated with clinical improvements such as increased oxygen consumption, increased cardiac output, reduced systolic BP, reduced peripheral resistance, increased left ventricular ejection fraction, improved ventricular arrhythmias, and overall improvement in symptoms.35, 40, 48, 58 There have been reports linking sauna baths to sudden deaths; however, these incidents have been shown to be at least partly due to alcohol consumption, which may have led to these accidents.59 A combination of sauna bathing and alcohol consumption increases the risk of hypotension, cardiac complications, and traumatic events.57, 60 However, the hot sauna exposure could potentially be harmful in patients with symptomatic and unstable disease conditions, such as unstable coronary artery disease.4 Contraindications to sauna bathing have included unstable angina pectoris, recent myocardial infarction, uncontrolled hypertension, ischemic or decompensated heart failure, or severe aortic stenosis.3, 57, 61 People with orthostatic hypotension or severe valvular disease should also exercise caution during the sauna bath because of possible sudden decreases in BP, which may also occur during the recovery period after a sauna session. In a study conducted in young Finnish men, the plasma noradrenaline concentrations increased approximately 2-fold during bath sessions with a mean temperature of 88°C and a mean duration of 22 minutes whereas there were no substantial changes in plasma adrenaline and serum thromboxane concentrations.68 Although these hormonal changes have been documented, hot Finnish sauna and cold-water immersion have been shown to be hemodynamically well tolerated without the occurrence of complex ventricular arrhythmias in patients with heart failure.11 However, regarding wide recommendations to combine Finnish sauna with immediate cold exposure in patients with unstable CVDs, because of the strong alteration in the human physiological responses between heat exposure and cold-water immersion, there still remains a possibility of sudden hemodynamic changes and risk of arrhythmias, especially in patients with recent acute myocardial infarction.55 Case fatalities have been recorded as a result of people diving head first into cold water right after a sauna bath69 because of the constriction of the coronary arteries that decreases coronary blood flow and oxygen delivery to the heart.33 There is a tendency toward enhanced corticotropin and cortisol secretion and sympathetic activity by increased catecholamine secretion, which suggests that ice-cold water immersion is a potentially harmful activity in those who are susceptible to hazardous cardiac arrhythmias and other CVD symptoms.70 Therefore, large and well-designed studies are still needed in patients with preexisting heart failure, coronary heart disease, and cardiac arrhythmias to find whether regular sauna bathing, combined with different kinds of cooling-off periods at various temperatures, is a safe activity. There are established guidelines for the prevention and management of the acute and chronic disease conditions discussed above. This section is therefore not intended to recommend sauna bathing as a routine remedy for the treatment or prevention of these conditions, including major CVDs. Well-designed RCTs with long-term follow-up will still be needed to confirm whether the observed associations reflect a true causal effect of frequent sauna bathing on these health conditions, and more studies are warranted to find whether regular sauna bathing could produce longer-term changes in cardiovascular health. In addition, available evidence is based on Finnish sauna baths with temperature settings around 80°C. It is not known whether saunas operating at lower temperatures or other passive heat therapies would yield similar cardiovascular effects and health benefits. This is a topic that requires further investigation. Sauna bathing, an activity used for the purposes of pleasure, wellness, and relaxation, is linked to a remarkable array of health benefits. It is a safe activity and can even be used in people with stable CVD, provided it is used sensibly for an appropriate period of time. Plentiful putative mechanistic pathways underlying these associations have been proposed, but many of these are not well understood. Further research work in the form of well-designed intervention studies is crucially needed to understand the pathophysiological mechanisms that underlie the associations between sauna bathing and its health benefits and to establish any causal relevance to the associations and whether these could be translated into clinical benefits. Sauna bathing may be a remedy to the call for additional lifestyle interventions needed to enhance health and wellness, particularly in populations that have difficulty exercising, and also as an adjunct to exercise. Strandberg TE, Strandberg A, Pitkälä K, Benetos A. Sauna bathing, health, and quality of life among octogenarian men: the Helsinki Businessmen Study [published online ahead of print November 29, 2017]. Aging Clin Exp Res. https://doi.org/10.1007/s40520-017-0855-z.